Those words top my notes from last June’s public meeting for City Planning’s Danforth Avenues Study, endured in non-air-conditioned discomfort at Hope United Church. Yet, eight months later, I think back more to a moment I almost missed. Needing a break from the heat and din, I went outside and soon found myself semi-accidentally eavesdropping on two men out for a smoke. One mentioned, apparently in seriousness, “how great it would be” if Stephenson Avenue had a direct at-grade entrance to the GO platforms’ west end, like the one off Little York Road across the tracks. Talk about a modest request – yet the point illuminates an oft-overlooked reality. Humans on foot seek directness; it’s why they beat diagonal paths into lawns, why areas with short blocks are more apt to be vibrant. Years earlier, a related thought-stream was spurred by a spectator at a kids’ hockey game at Ted Reeve Arena, where I volunteer. The woman pointed out her grandson and we got talking. At one point she mentioned that – despite living 30-plus years at Main Square without a car – she’d never crossed the Main Street bridge on foot. She claimed to like walking (downtown or at the boardwalk) but the only local pedestrian destinations were the subway station, Sobey’s, Canadian Tire and Len Duckworth’s Fish & Chips. She’d only recently learned about the existence of Stephenson Park. We put faith in planning theory, predictive models and expert reports. We’ve fixated for decades on the great divide between the Main Street subway and GO’s Danforth stop (a column topic for another day). But rarely do we notice the many small pedestrian disconnects in our neighbourhoods (and the broad area surrounding the GO station has more than its share). Seemingly trivial stories about how residents use – or don’t use – community elements can offer big clues to underlying factors shaping local economies and livability. That hockey rink discussion got me rereading parts of The Death and Life of Great American Cities. It was the first time I’d read Chapter 14 on “barriers and border vacuums” while thinking specifically of how our local rail corridor divides and subjugates. Barrier effects have always accompanied at-grade tracks, but negatives are more than offset while they lure economic activity and jobs. Alas, barrier effects outlived local factories, leaving them to overwhelm thinner primary-use mixes, straining vital bonds between retailers and residents. 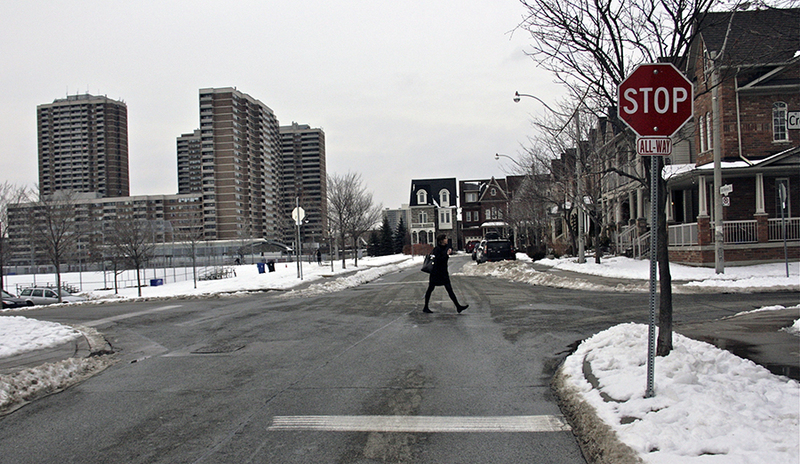 Without north-south links between Main and Victoria Park, for example, homes south of the corridor and Danforth businesses – not much more than a stone’s throw apart – are both perpetually on the wrong side of the tracks. Would residential and commercial communities have benefited by extending Dawes Road back down to Gerrard when the new ’hood was built? Tough to say; mitigating barrier effects isn’t easy. Cheap, haphazard attempts to breach rail corridors often fail badly. But questions like this should be prominent with key local changes imminent. Provincial transit agency Metrolinx is working on redesign ideas for Danforth station (including a shift to the east and new north-sound links between platforms). We’re planning now to be fully integrated with the Avenues Study. Bureaucrats seem to be listening. Main Square-owner Talisker has approval (granted in 2006) to build two more towers, though unit and retail upgrades are a bigger priority than new development, Talisker property management director Nathan McLachlan says. We need to make the most of the lead time at Main Square and Talisker’s apparent goodwill. Aside from neighbourhood-deadening long blocks in all directions on Danforth and Main, Main Square is hemmed in on three sides – by the rail corridor and storage facilities on the south, a suburban-style big-box store and parking lot on the east and an inhospitable bridge and extra-wide stretch of Main Street on the west. People do walk the bridge and walkscore.com gives Main Square an enviable 95 ranking. But many see a place in need of help, among them internationally renowned urban designer Ken Greenberg, who thinks the community might do well to sponsor a design competition in co-operation with the city. And let’s not forget there’s opportunity in listening to local non-experts – like that woman at the rink and the guys I so rudely listened in on. We’ll get our next chance on that count at the second Avenues Study public meeting, Thursday, Feb. 23, 7-9 p.m. at Danforth Mennonite Church. This column is part of a recurring series tackling urban issues in the East End. Connect with Stephen Wickens on Twitter @StephenWickens1. This article could be even more thought provoking if it were just a bit less bound by language such as “boundary vacuums”. Indeed the failing of such language is emphasized once more with mention of more use of non-experts being needed.And certainly no one can deny the over reliance on the “professionals” is exactly what has brought about our unhappy circumstances. Here’s hoping the public meeting isn’t only about lip service..
Not sure what was discussed at the meeting. Metrolinx has purchased the portion of land that belonged to the lumber yard at the end of Dawes Road to south of Danforth Ave. Their intent is to build a northern entrance to access the Danforth Go station for a kiss and ride area (it’s also mentioned in previous Metrolinx studies). Heard also that Metrolinx wants to buy the Legion with intent to add some parking spaces since there is none right now at Danforth Go but condo developers (would have to be low rise due to current by-laws) are also eyeing the Legion and other properties at end of Dawes Road. There will be a transformation of the area for sure in the next few years for sure. What you’re saying is quite true…our family business is directly across the legion and apparently it has been bought out by a developer.